Through our network of biorepositories and sample bioprocessing laboratories, we ensure chain of condition, chain of identity and chain of custody for all our client's samples. Brooks Life Sciences’ global network of biorepositories and co-located sample bioprocessing laboratories in North America, Europe and Asia are staffed with sample lifecycle management and QC/QA experts. Our facilities adhere to consistent best-practice protocols, with certification that includes FDA approval, ISO 9001:2015 accreditation, CAP and CLIA certification. Our subject matter experts will partner with your team to configure sample lifecycle management solutions best suited for your workflow requirements. Plan: Based on your research goals, sample type and project priorities we will propose sample lifecycle solutions, appropriate protocols, and business continuity plans. Collect: Our end-to-end cold-chain logistics solutions, including custom collection kit management services, support active clinical trial projects. We can consolidate your sample assets into an efficient on-site or offsite biobank at the end of a study. Transport: With the most extensive and advanced sample transport and mobile biorepository fleet, we guarantee auditable chain of custody for each sample. Our highly trained life sciences relocation teams partner with leading international surface and air carriers, can securely ship individual samples or an entire biobank, or relocate complete laboratories, equipment and other research assets anywhere across North America. Process: Whether samples are stored onsite at customer premises or at our biorepositories, our configurable hardware and software solutions for sample preparation, cell line, genomics and genetic services, and bioanalytical data management meet the highest expectations of leading global organizations. 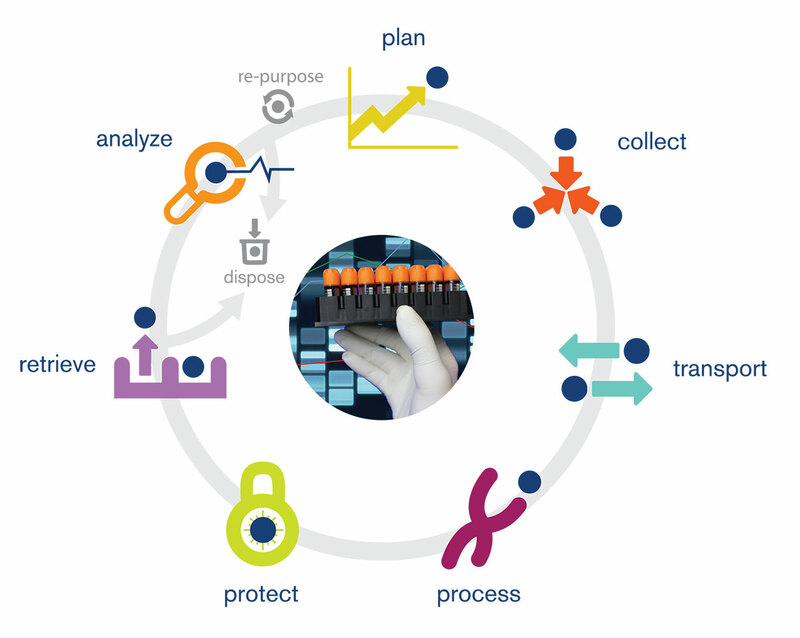 Protect: From our carefully-monitored controlled temperature environments to our secure access facilities, integrated with our FDA-compliant software, and purpose-built redundancies, we take every step possible to protect your sample and data assets from potential security threats and operational inefficiencies. Retrieve: Our biorepository network guarantees sample retrieval and secure shipment within 24 hours of a request, whether you need one vial or 1,000 anywhere in the world. Analyze: Value of a sample is in the data contained within. With the highest integrity protection of your sample assets, our single platform informatics and data integration solutions empower your discovery and development decisions. Re-Purpose: Contingent on study protocol and R&D priorities, the usability of samples is extended by securing its highest integrity, sample prep and bioprocessing, based on best-practice protocols. We collaborate with customers to realize efficiencies by maximizing the value of their sample assets. Dispose: Upon customer request for final disposal, our protocol holds samples in pre-destruction storage for 30 days, just in case there is a need for usage. Once incineration does take place, we provide full documentation of sample disposal. Certified Sample Managers: Brooks maintains a Good Tissue Practice (GTP) license for the storage and distribution of human cells, tissues, and cellular and tissue-based products through the FDA.We are also a licensed tissue bank in New York, California, Delaware, Illinois, Maryland, and Oregon. Real-Time Sample Tracking: Our proprietary sample tracking software solution, BioInventory allows customers 24/7 access to sample inventory and shipment audit trail. FDA 21 CFR Part 11 Compliant Software: Our database keeps track of the movement and condition of all your samples within our database, allowing you to prepare for audits and monitor compliance. Business Continuity: Our biorepositories are each equipped with multiple redundancy systems to ensure the highest sample integrity, even in the event of a natural disaster or other emergencies. Sample Bioprocessing: Most of our biorepositories are co-located with laboratories for bioprocessing services including sample preparation, cell line and genomic and genetic analysis services. True Best Practices: Our comprehensive sample lifecycle management solutions have been developed around over 150 industry best-practices, many of which we set as the industry benchmark for excellence. The BioStore III Cryo System provides customers the best-in-class storage solution for regenerative medicines, cell therapies and samples. FreezerPro is an intuitive, plug and play sample monitoring software that tracks the status and journey of your samples into and from storage freezers.